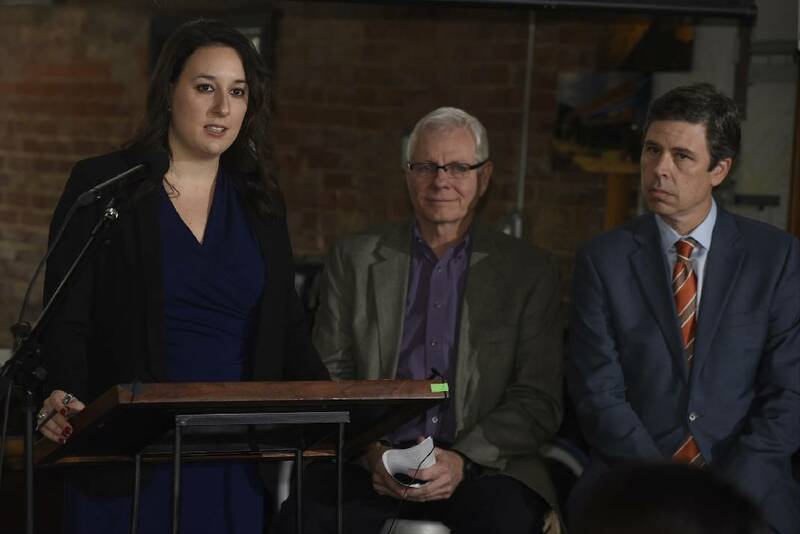 Jamie Statter of the U. S. Green Building Council speaks during a news conference Tuesday, Jan. 12, 2016, in Chattanooga, Tenn., to announce that the EPB's smart grid program earned a Performance Excellence in Electricity Renewal (PEER) certification. Sitting next to her are EPB COO David Wade and Chattanooga Mayor Andy Berke, right. When EPB's smart grid detected this week that a Chattanooga household was suddenly using a lot more electricity, a representative of the city-owned utility contacted the renter who quickly turned off the heat, contacted her landlord and discovered a faulty heater was using excessive power. "We were able to alert the unsuspecting customer in time for her to take action and avoid a hefty bill that she was not expecting because there was a piece of equipment that was malfunctioning," EPB Executive Vice President David Wade said Tuesday. "We've built a great platform to give us and our customers a wealth of data to detect problems earlier and to better manage our power grid for reliability and efficiency." The $220 million platform of fiber optic wires, intelliruptors and other smart grid equipment installed over the past six years across EPB's 600-square-mile service area gained national attention Tuesday when the U.S. Green Building Council recognized Chattanooga as America's first city to be certified for a new environmental distinction for electric power systems. The environmental group, which already certifies thousands of buildings around the globe with its LEED (Leadership in Energy and Environmental Design) certifications, has added another recognition process to help define and award sustainable power networks. The new PEER (Performance Excellence in Electricity Renewal) certification is based upon how reliable, efficient and sustainable an electric utility is in delivering and helping customers use power. Chattanooga Mayor Andy Berke speaks during a news conference Tuesday, Jan. 12, 2016, in Chattanooga, Tenn., to announce that the EPB's smart grid program earned a Performance Excellence in Electricity Renewal (PEER) certification. Standing with him is Jamie Statter of the U. S. Green Building Council. Aided by a $111.6 million federal stimulus grant awarded in 2009, EPB has built one of the most sophisticated smart grid power networks in the country with more than 1,200 intelliruptors installed throughout EPB's service territory. The devices help immediately detect power interruptions and voltage swings and reroute power to minimize the number of customers affected by storm-related outages. Wade, who calls the system "self healing," said EPB has created a communications and power backbone that should aid the city in new distributed energy, load controls and demand response programs that cut both energy waste and power interruptions. Since the smart grid was deployed in 2009, power interruptions have been cut by 55 percent from what they would have been without the smart grid technologies, Wade said. EPB also has begun offering time-of-day pricing and energy audit and conservation programs, which Wade said may be expanded next year. Jamie Statter, vice president of strategic relations for the U.S. Green Building Council in Washington D.C., said LEED certifications "have helped transform the energy efficiency of the places we work, live and play" by setting a standard for judging the sustainability and energy efficiency of a building. Statter said she hopes the new PEER standard will do the same in setting definable standards and encouraging upgrades from America's power industry. "The work that Chattanooga has done around your river cleanup, the fiber optic network and other environmental initiatives have made you truly a leading 21st century city," Statter told dozens of local community and government leaders gathered for the PEER cerification on Tuesday. "This is how market transformation occurs and we want to recognize that." The U.S. Green Building Council presented city and EPB officials the first municipal PEER certification during a ceremony Tuesday at green/spaces on Main Street — the first LEED platinum-certified building in Tennessee. The Green Building Council previously awarded the first of the new PEER certificates in the campus category to the University of Texas in Austin, Statter said. The PEER certifications are based upon 69 criteria used to evaluate a utility's operational effectiveness, customer contribution, reliability and resiliency, and energy efficiency and environment. Chattanooga's power grid scored nearly 23 percent higher than the designation's base standard. Mahesh Ramanujam, chief operating officer of the U.S. Green Building Council, praised EPB for "proactively working to set the bar higher in sustainable electricity." 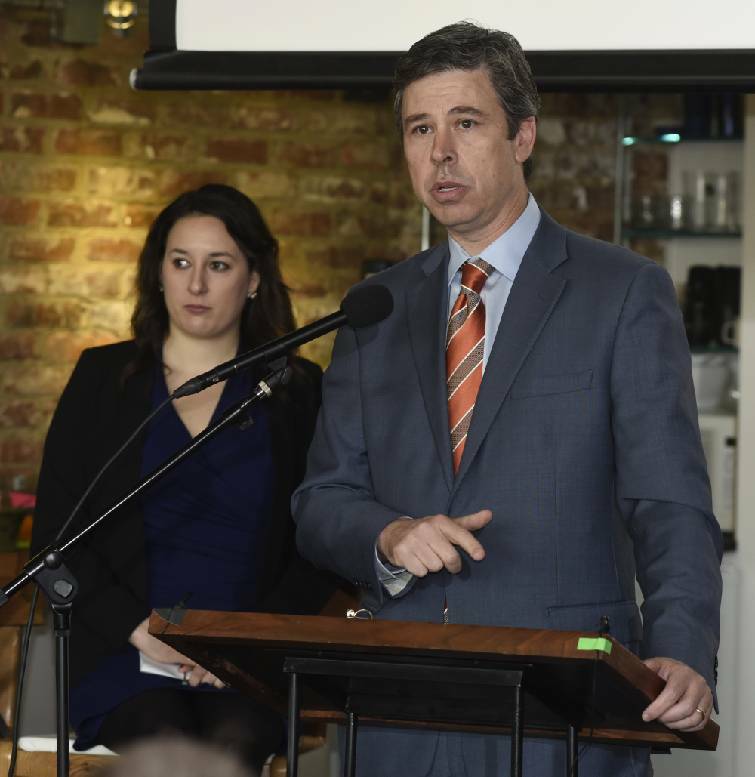 Chattanooga Mayor Andy Berke said EPB's smart grid and Gig Internet connection — both powered by the fiber optic wires EPB began laying seven years ago — provide the world's fastest Internet service as well as one of the more reliable power networks. 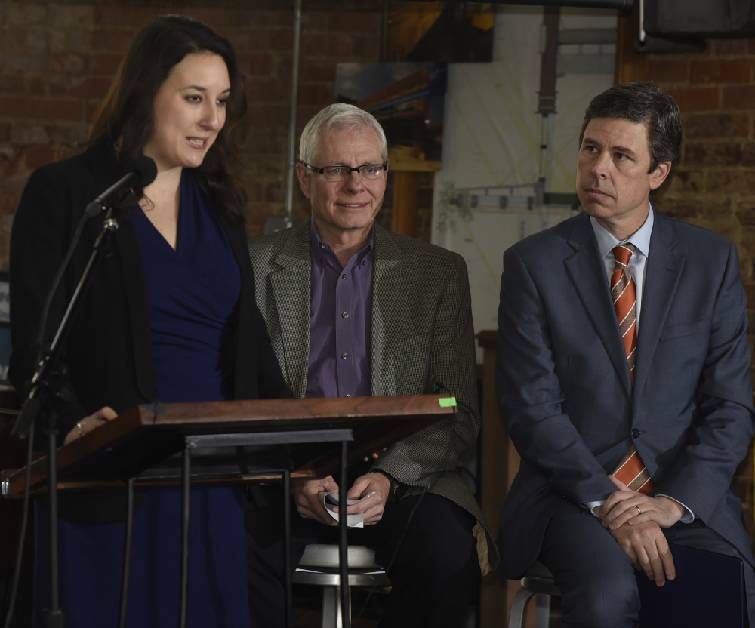 "If it's going to be first, it's going to be in Chattanooga," Berke said. "As a community, we understand that energy is today's currency. When businesses come here and they are looking for a place to locate, the reliability of power is crucial and making sure it is affordable is key." Berke, a Chattanooga native, recalled the polluted water and smoke-filled air in Chattanooga' past — much of it due to energy production for area factories and utilities. EPB's smart grid is helping to clear the air and water by facilitating cleaner energy generation and limiting energy waste. That is beneficial to both the environment and the economy, city and county leaders said. "Having the most advanced electric system in North America continues to be an excellent recruitment tool for new industry," Hamilton County Mayor Jim Coppinger said. Updated Jan. 12 at 11 p.m.